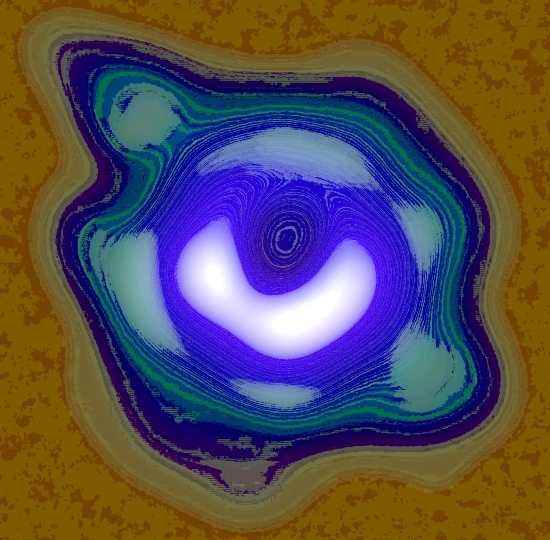 Nice, I messed around with the image a bit and got some pretty interesting results. By adjusting the color levels and hue slightly I was able to highlight the details hidden in the image. It appears there are some sort of lines indicating how space-time is being warped, it looks like we can see how the light from the back is being warped around the sides so we can see what's behind it. 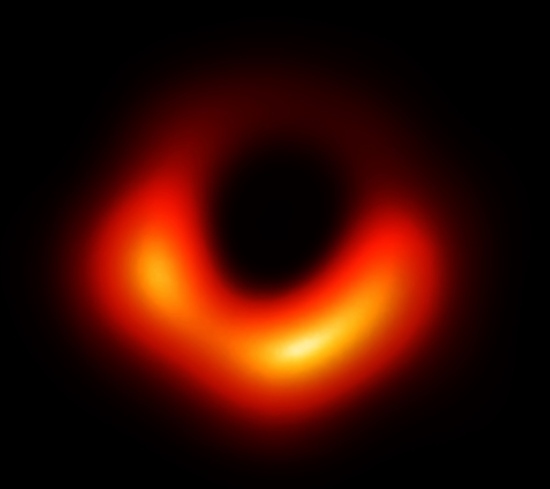 Here's another pic where I adjusted the levels to try to highlight the details of the accretion disk around the black hole, which also had the effect of making the inner shadow more clearly defined, and shows us that the shadow does appear to be more egg shaped than circular. Standard theory says it should be circular so this could be telling us something. Like the Earth is circling the drain of the Sun? In other words, no. Quite different. If a Black Hole is at the center of our galaxy It's feeding right ? Which would explain the spiral shapes of most galaxies correct ? Like the Black hole is a engine of some sort . If a Black Hole is at the center of our galaxy It's feeding right ? Yes and eventually it will consume the entire galaxy, it will just take a ridiculously long time. Which would explain the spiral shapes of most galaxies correct ? There are many different galaxies of many shapes and sizes, the spiral galaxy is only one type. From what I recall, it's still not fully understood exactly how the spiral arms form but I haven't researched this stuff in a while. I remember a really old conspiracy film about UFO's where this guy suggests the spiral shape has to do with the intense gravity around the black hole in the center of spiral galaxies, because gravity affects the flow of time and therefore affects the orbit of matter as it gets closer to the core, causing the spiral pattern to emerge. It always struck me as quite an ingenious idea actually. Not necessarily. But any matter with insufficient angular velocity relative to it will fall into it the same way comets occasionally fall into the Sun. Like the Black hole is a engine of some sort . No, just a very dense accumulation of matter. Like the Sun, only more so. While most, if not all galaxies, seem to have black holes at their centers they are not bound by the gravity of that black hole. Our black hole, for example, is far too distant and not massive enough to keep us in orbit around it. The Sun orbits the center of mass of the entire Milky Way (which is way, way more massive than the black hole but does include it), there just happens to be a black hole there. I don't know why. Well if you want to get really technical I believe orbiting bodies are constantly losing a very small amount of energy via the gravitational waves they emit, so even if there wasn't any dust or anything else to slow down our orbit over time, our planet will eventually fall into the Sun. Bodies with enough velocity may escape the solar system before being engulfed by the Sun, but eventually they will fall into a star or black hole, and eventually the only thing left will be black holes, until they fully evaporate. so even if there wasn't any dust or anything else to slow down our orbit over time, our planet will eventually fall into the Sun. Nope. We won't fall into the Sun. The Sun will expand and engulf the Earth.